A photovoltaic module or photovoltaic panel is a packaged interconnected assembly of photovoltaic cells, also known as solar cells. A single photovoltaic module can only produce a certain amount of wattage. Installations intended to produce larger electrical power capacity require an installation of several modules or panels and this is known as a photovoltaic array. Photoelectric cell uses the photovoltaic effect to generate electrical energy using the potential difference that arises between materials when the surface of the cell is exposed to electromagnetic radiation. Murickens group - the whole sale and retail distributors - sells two kinds of ISO certified solar panels- Poly-crystalline and Mono-crystalline. Solar cells are the byproducts of silicon. Poly-crystalline is made up of billions of small silicon crystals, but Mono-crystalline material is made up of one large crystal of silicon. Mono-crystalline solar panel is more efficient in converting photons to electrons for electricity while the poly-silicon is less efficient because electrons are captured or generated less efficiently where the crystals of silicon touch. Poly-crystalline panels are commonly used because of competitive price. 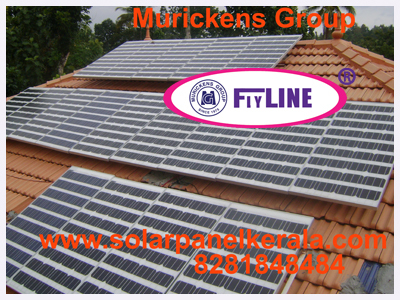 Mono crystalline solar panels have the ability to create current in cloudy conditions and even when it is raining .In the climatic conditions of kerala 1000 W Solar panels can create 4.5 Kwh to 5 Kwh electricity per day.As we are the first manufacturer and supplier of Solar Inverters in Kerala with15 years of experience in this field we have a good number of highly valued and reputed clients and the list of our satisfied clients include Kerala Agriculture Research University, Malappuram, International Airport, karipoor, The CISF 7th battalion military camp, Hyderabad, Govt. of India, Dept. of Space, Sreeharikotta, Central Marine Fisheries Research Institute, Cochin, , Vallarpadam Container Terminal (IGTPL), TCS Info Park Cochin etc in addition to a large number of our esteemed clients in the Private Sector. .it is most important that the installation should be undertaken by a well qualified and experienced technical expert to get 100 per cent out put of the system to fecilitate a smoothg and trouble free functioning and to avoid unnecessary expenses. ► High quality solar photovoltic Silicon Mono / Multi crystalline panels or Cells. ► German cells assures the quality of product.► It is union of solar cells for desired capacity. ► Light weight and designed for getting maximum utilization. ► Resistant to abrasion, hail impact, rain, water and environmental factors. ► Anodized aluminum frame and pre-drilled mounting holes. ► Tempered glass for rugged protection. ► ISO 9001- 2015 certified. ► IEC 61215 certification by Euro Test and TUV. ► 5 years warranty. ► 35 years working life for flyline mono and Poly crystalline solar panels. ► 1000 W Flyline solar panel has the capability to generate 4 to 5 units per day. ► Each panel Test specification chart is on backside.